Works well, and offers very good value. Slightly larger dials would be handy - asides from that it's great. 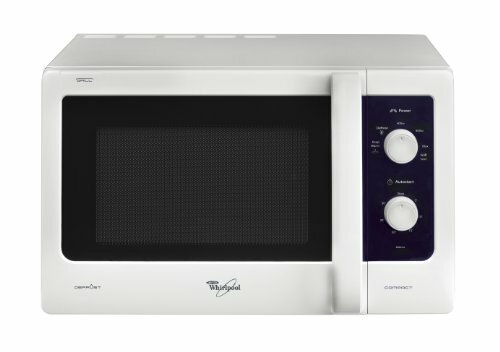 The Whirlpool MWD202WH Microwave is aimed at smaller kitchens and households, due to it's small dimensions and capacity - just offering 18 litres. That's not to say it doesn't have it's advantages - it offers good value at around the £70 mark, and looks smart too, in it's neutral white colour scheme. Finished in a white exterior, it is ideal for those who want a cheap, yet simple to use microwave oven. It might not be finished in expensive brushed stainless steel, but it is perfectly functional, and cooks food evenly, with no hot spots or partially cooked food. The MWD202WH microwave provides 750w of power, and ran fairly quietly during the testing period. The timer provides up to 30 minutes, and if we're being fussy it would have been nice for it to be a touch larger - simply to give you a little more control, as for shorter time periods you have to be quite accurate to avoid overheating. None of our testers found this to be a major problem though. The grill worked well, and left food with a crisp coating - no issues here. Whirlpool are renowned for making reliable appliances, and with this microwave it is no exception - the controls were simple - simply select one of the cooking settings using the top dial, and then set a time period using the bottom dial - and as such this is an ideal microwave for the elderly.